Optical illusions play tricks on our mind, and this particular snap represents how the same thing can appear entirely different. By moving one’s position ever so slightly, the perspective changes, with the artwork no longer representing what it once did. In this particular optical illusion, which was posted on Twitter, a patch of green grass can be seen divided into sections with the help of white lines. The lines appear curved, creating the effect of the grass patch seeming to be spherical. The first image also shows a number of trees emerging from the grass, which is thought to be in a public space in Paris. Due to the arcs of the white lines, the photo appears to show a depiction of something similar to a grass-covered planet earth. In the first snap, it is implied that the trunk is coming directly out of the seemingly 3D shape. However, by moving several steps to the left, the view completely changes. 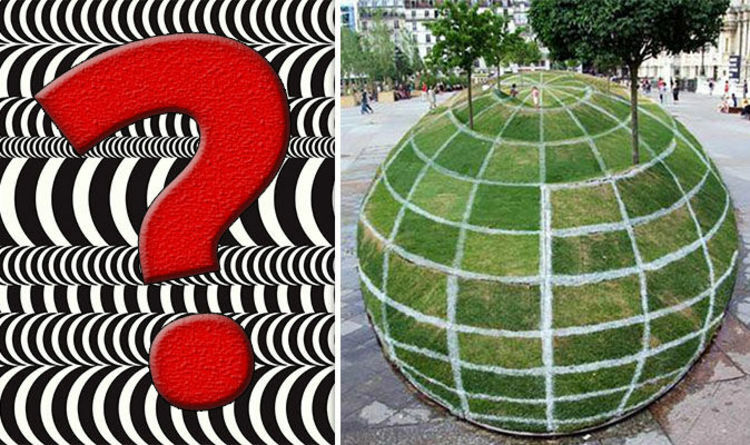 Instead of the spherical art, there is actually just a flat plot of greenery. The optical illusion was created by a number of white lines being drawn with specific curves. There is also one section which has been blocked in in white paint. Rather than a circular section of grass, the space actually spans far into the distance – so much so that the members of the public appear to be far smaller than they actually are. Meanwhile, rather than the trees seeming to emerge from the sphere, in the second snap, it’s clear that the plants have grown from the flat soil in the park area. The two captures were posted on Twitter by Health Beauty Listings, via the handle @youcanbhealthy. Another incredible work of art doubled as an optical illusion in a video posted online recently. The clip saw seven red chilli peppers on a sheet of white paper, with each item being numbered. In the footage, a person can be seen picking up a ruler, before placing it next to the blank background. However, even the most eagle-eyed of viewers would be forgiven for not picking up on the deception in this clip. All is soon unveiled, as they drag the ruler across the page – resulting in six chillies being moved from the sheet. However, one remains firmly in place – due to it actually being an incredibly realistic 2D drawing.